Three thieves victimized customer inside Burger King in Cebu on June 13, 2015 which video became viral and trending online. The video shows three suspects (2 boys, 1 girl) easily steal a bag of a customer who is eating inside the fast food restaurant. The video posted by Kenny Tiu in facebook circulates online. "Happened on a Saturday, one of my family member was in Burger King (Panagdait Mabolo, Cebu city branch) around 4pm. 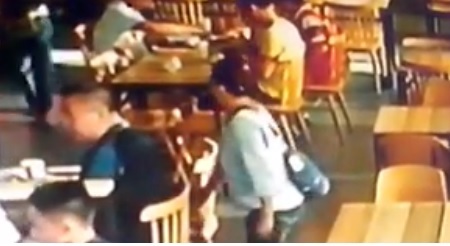 *cctv footage was provided by Burger King.There were 3 clear suspects and the, to be debated 4th suspect is the girl wearing yellow on the upper left corner can be seen on 0:27 of the video.Suspect 1 bumped the table spilling the drink, when the victim turned his head to the other side suspects 2 and 3 grabbed the bag and fled.These thieves are Everywhere even on well lighted, crowded and decent places. Do not leave your valuables unattended even for a second or have your bag strapped with you at all times.We tried reporting to the police and filed a report- we are waiting for an update from them nalang. Hoping that this will serve as a lesson to everyone and we could share it to our loved ones.If you happen to have an idea on the theives please do shoot me a message.This video is copyrighted and owned by the uploader."